I love how fast flying gets me to my destination so I can start my vacation, but I am not a fan of the airport. I completely understand the necessity of the screening process but still feel overwhelmed by it, no matter how many times I travel. Every airport seems to have its own way of doing their screenings too, which causes real confusion! 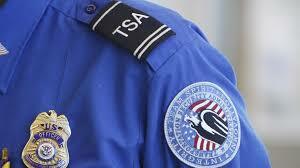 Now imagine you have a medical condition that makes going through the security checkpoint a very difficult process. My son, Mike, is on the autism spectrum and has type 1 diabetes. He wears a wireless insulin pump that uses Bluetooth technology and carries back-up syringes. He is supposed to avoid scanners as they can interfere with the pump's programming and he always gets his bag pulled for the supplies in them. This causes him severe stress and anxiety as he waits in line because he knows this will happen. By the time we get to the agent he can't even verbalize his needs and can be inconsolable. I had recently heard the TSA Cares program can help travelers with disabilities and medical conditions navigate the system so my family decided to try it on our most recent vacation to Florida. It really helped our family get through the anxiety of the screening process at the airports with ease. The Support Specialists were kind yet efficient, and took the time to explain step-by-step what we needed to do. Three days before our departure I called TSA's toll free helpline at 1-855-787-2227 and spoke to Jeanette. She was very friendly and patient with my questions. She took my flight information and put it in the system. She asked what accommodations we would need and made note of each of them. She asked clarifying and relevant follow up questions. Her knowledge of the process and the special needs of my family really helped put my mind at ease. She sent me an email confirmation outlining how the program would work for my family. Jeanette further explained that each airport handles the support program differently and that some would contact us in advance and some would not. It is also only available in US airports. She also directed me to their website to download and print out a card I could use at any airport for assistance, even if I couldn't call in advance. Within 24 hours I received a call from PIT (Pittsburgh International) airport support. They gave me a number to call once I checked in for my flight. When we arrived and called the number, a TSA Support Specialist met my family at Arch (the giant mechanical statue). He went through the entire process of how the screening would go. They would not separate us for the screening. He confirmed the special services we needed and walked through security with us, talking to us the entire time about next steps. He even sat with my son Mike after the screening and chatted about our vacation while Mike put his shoes on and got re-organized. For our return flight out of MCO (Orlando International) we hadn't heard from anyone prior to our arrival at the airport. I used the TSA Card Jeanette had recommended and showed it to the first TSA officer I saw. She had our family stand to the side while she called a Support Specialist, who arrived to meet with us in just a few minutes. The Support Specialist explained to Mike every step of the process and stayed with us through the line and screening. When Mike started to get to the private pat-down screening he started to get very agitated with his eyes darting between me and the Support Specialist. She must have picked up on it and said there was a male officer that would handle it and that we were all allowed to stay together through all of security. When we reached the gate area I found I had missed a call from MCO's TSA Support team. They had called 2 hours before my flight to make arrangements. They must have called while we were going through security. The TSA cares program really helped my family make it through security this trip without Mike freaking out or melting down. It was one of the smoothest TSA screenings we have had with him in all the times we have traveled. If you have someone with special needs or a medical device, I recommend this services.